On the 20th we were headed to Dali, in China’s Yunnan Province. Dali is a 40 minute flight from Kunming, and a roughly eight hour bus ride from Lijiang, both of which I visited in 2006. Yunnan is one of China’s most heavily minority populated provinces, and has significant representation from almost 30 different minority groups. As such, it has a very diverse and complicated history. 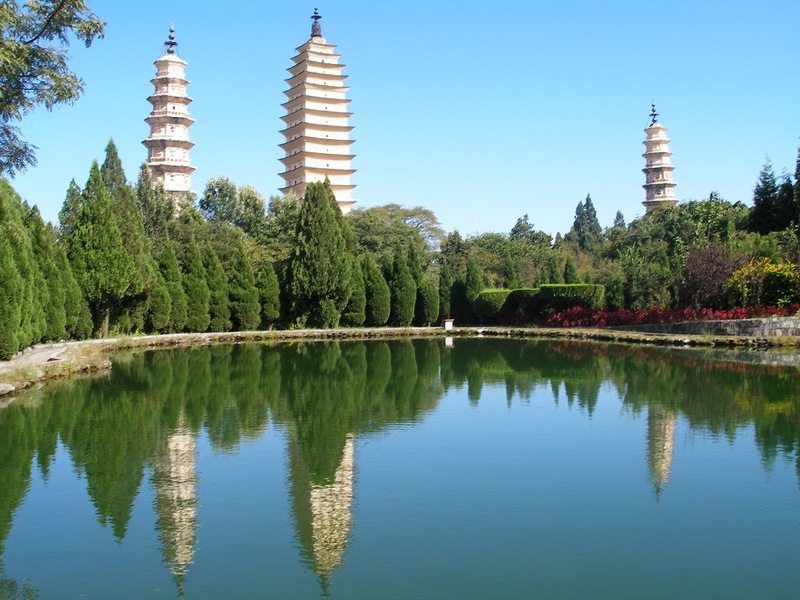 Dali itself is the ancient capital of both the Bai kingdom Nanzhao, which flourished in the area during the 8th and 9th centuries, and the Kingdom of Dali, which reigned from 937-1253. Dali was also the center of the Panthay Rebellion from 1856-1863. Dali has an old town which used to be encompassed within city walls, but now only the gates remain. There is also a new town to the south, called Xiaguan. Both are sandwiched between the Cangshan Mountains and Erhai Lake, second largest highland lake in China (at 2000m above sea level). It’s an incredibly scenic area and a popular spot for western tourists as it has many English speaking hostels, restaurants and other services. On our first full day in Dali (the 21 st), we spent half the day just walking around to get the lay of the old town. Fortunately for us it was market day, and the market was roughly a block from our room at the Jade Emu Hostel, so we took a turn through there before even getting to the old town. The interesting activities going on there: (1) the pepper rush, there were probably a dozen stands stacked feet deep in peppers and each one had a dozen people fighting over and stuffing big plastic bags with peppers, (2) sidewalk dentists, (2) bong merchants. 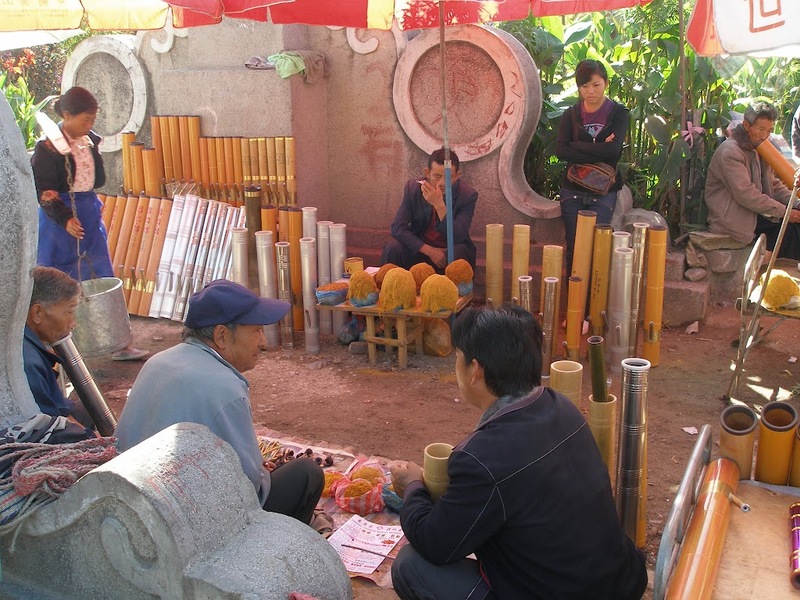 One interesting thing about Dali, and other places in Yunnan, is that you will see a lot of old minority guys smoking bongs. Each area in Yunnan seems to have a special tobacco. 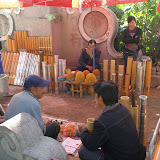 In Dali, it’s the yellowish stuff you can see in the pictures with the bongs. In Dali, however, it’s not all that hard to get the sort of product Americans are more used to using in bongs. Apparently there is some leeway accorded to local ethnic minorities who… partake and/or distribute. In fact, while walking through the streets of Dali you will be frequently approached by old ladies asking “smoke the ganja?” It’s entertaining, and while it is the real thing, word is that it’s on the weak side. However, if you hit some of the local establishments at night you would not be hard pressed to score some good stuff and/or see it being used. More could be said, but I’ll leave it at that. 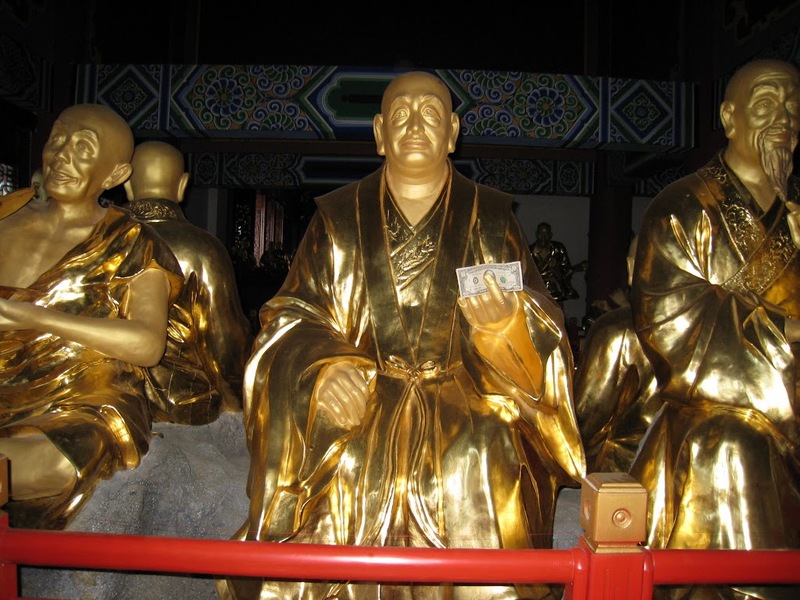 In the same area as the Pagodas (and covered by the same admission fee) is the Chongsheng Monastery. 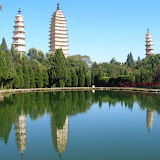 In fact, the Monastery and the main Pagoda form a straight-line axis radiating from the Erhai Lake. Chongsheng Monastery was originally built at the same time as the central Pagoda but has proved much less resistant of earthquakes and fires. The current monastery dates from 2005. The pagoda/monastery grounds are quite impressive and are a decent cardio workout. I’d guess it’s a good couple mile roundtrip from the pagodas through the monastery grounds (all uphill) to the top temple. The view is worth it though. We barely made it back before the area closed. In fact, they sent someone after us to collect our little English tour recording machines, in case we didn’t make it. 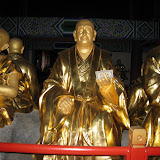 Bonus... Arhat Hall in the Chongsheng Monastery. Dali makes the fourth 500 Arhat Hall I’ve been to (Chengdu, Hangzhou, Beijing, Dali). The sign in front of the Beijing Hall says there are only four total, but I think this is wrong because as far as I know there is one in Anhui & Chongqing too. In the evening, we had another great Chinese dinner. We ate especially well on this whole trip. We just seemed to pick the right places and/or have good help ordering every time. Great stuff.